Many American cities have rodeos but Greeley, Colorado, has the "Worlds' Largest Fourth of July Rodeo." The city was named after Horace Greeley, a well-known newspaperman for the New York Tribune. One of his famous sayings was "Go west, Young Man, go west." In 1869, he sent one of his reporters west to Colorado to write a story about farming. The reporter, Nathan C. Meeker, liked the area so much he stayed and started a town named after his boss. It was Meeker's vision that helped establish a successful community based on, among other qualities, cooperation, agriculture, irrigation, and education. Every year the people of Greeley celebrate Independence Day with a rodeo. In the early days, the rodeo was a small local event, but it grew more and more popular. In 1922, more than 10,000 people came to the rodeo, and the town officially named the event the "Greeley Fourth of July Celebration and the Spud Rodeo and Horseshow." They called it the spud rodeo because spuds (another name for potatoes) are an important crop grown around Greeley. A few years later, even more people came to the rodeo, when famous cowboys started competing with the local ranch hands. 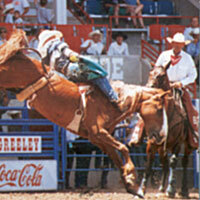 Today, the rodeo lasts for two weeks and is called the Greeley Independence Stampede.